What Color is the Dress Actually? 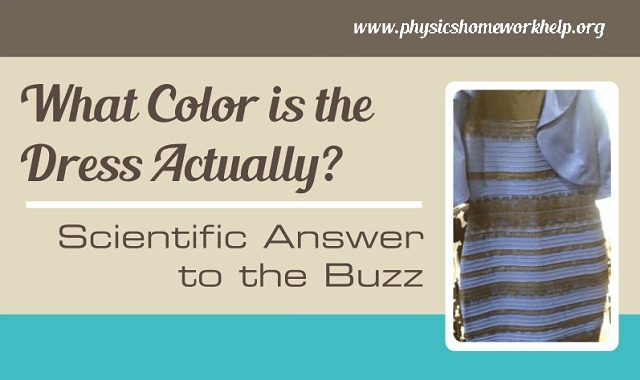 #infographic ~ Visualistan '+g+"
People all over the world have been debating over the color of the dress, that in a few days has been named as the viral phenomena. We can laugh over it, we can tweet about it, we can hate it, but we can't stop from wondering, how is it possible for other people to see something drastically different from what we are seeing? In the modern world with the advanced innovation technologies, that can create amazing visual effects and optical illusions, it’s quite unbelievable, when a simple photograph creates such a buzz. We feel like we have seen it all, know it all, and then start "googling" such words as "Purkinje effect" to better understand the nature of the mystery unveiling before our eyes. We also get a sense of universal unity, when we stop to think, that people from all over the world, - distant Siberia and the glamorous Hollywood - have been looking at the same picture as we are and arguing about what they see.